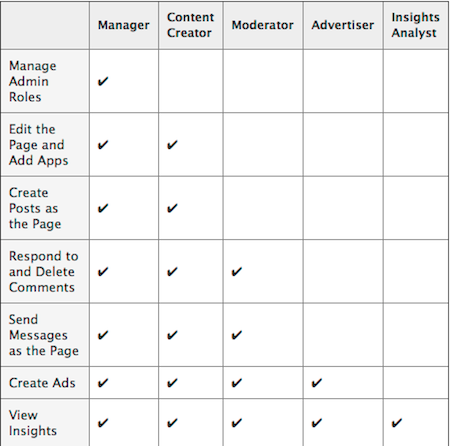 Now, Facebook has added a number of new roles for your Page so that you don’t have to give someone total control over your Page. In many ways, the new roles will seem familiar, mirroring some of the editorial roles that are familiar in a news organisation. As you create your Page, it’s definitely important to keep these roles in mind and use them to make its management more effective. You might not want to give all staff the ability to manage the page, but you you might want to give key staff the role of content creator. The role also allows you to give access to your advertisers so that they can see how your page is performing. As your Facebook strategy evolves and grows, you might want to give community managers who manage comments on your site the ability to monitor and moderate comments on your Facebook page as well. For key members of staff who engage with your audience, you might want to give the ability to create posts for your page as well. Regardless of how you break up the tasks, the new roles give you flexibility in how you manage your Page and your Facebook presence and helping you manage it more effectively as your presence grows.